When production of the Dodge Avenger began in 1970, drivers in Regina and Moose Jaw were unable to purchase it. That’s because this model wasn’t available immediately to consumers in the United States and Canada. Since the Avenger arrived in North America, there have been two generations of this vehicle that Dodge drivers have had the opportunity to get behind the wheel of. In 1995, the Avenger was finally introduced to North American drivers. It was built as a two-door coupe and was similar in size and price as the Daytona, which was discontinued after 1993. The first generation model was powered by either a 2.0L inline four-cylinder engine or a 2.5L V6 Mitsubishi-designed motor. With the four-cylinder engine, you had either a five-speed manual transmission or a four-speed automatic. There were a number of changes made throughout the existence of the first generation Avenger. In 1996, the power and torque ratings for the V6 engine were increased. A new sport model was introduced a year later in 1997, which offered exclusive 16-inch aluminum wheels and a body color spoiler. In 1999, driver and front passenger airbags were added, as the V6 engine and automatic transmission became standard. The Dodge Avenger Coupe’s final year was 2000. Before it was discontinued, new features that were added to the coupe included power locks and windows, optional ABS, cruise control, and 4-wheel disc brakes. After a brief hiatus, the Avenger returned in February of 2007 as a 2008 model. This time, instead of a coupe, consumers were looking at a four-door midsized sedan designed to replace the Dodge Stratus. There were three powertrain options: a 2.4L “World Engine,” 2.7L V6, and a 3.5L V6 engine. Other features drivers could enjoy include optional heated/cooled cup holders, in addition to a “chill zone” which can store up to four beverage cans and acts as a refrigerator, cooling the drinks down to 40 degrees Fahrenheit. Major changes occurred in 2011. The exterior was redesigned to include slightly revised sheet metal with a new grille that displayed the Dodge logo. Inside the car was a completely redesigned dashboard that featured a navigation/media center screen, better cushioning, and improved upholstery. The latest Avenger model has four different trim levels for consumers to choose from: Express, Mainstreet, Lux, and Heat models. Each level has a bevy of options to choose from, ensuring that the Avenger is a great fit for many drivers. Crestview Chrysler, located at 601 Albert Street in Regina, SK, is about an hour away for drivers from Moose Jaw. To get to our dealership from Moose Jaw, take Trans-Canada Hwy/SK-1 for almost 62 km to the Albert Street ramp and then go another 8 km on Albert Street/Canam Hwy. 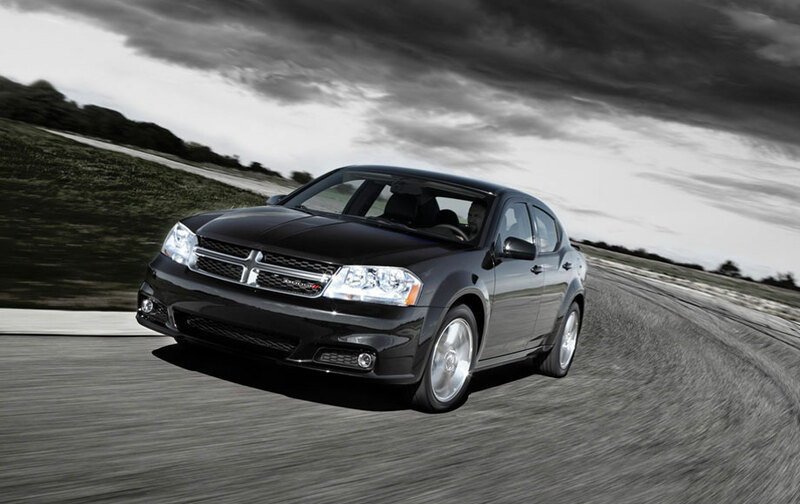 Stop in our office and ask our sales staff how you can get behind the wheel of a new or used Dodge Avenger.